Secretary of State John Kerry's push for a ceasefire in Gaza last week was so flawed it managed to unite Israel's fractious political leadership in opposition while simultaneously being lambasted by the Palestinian Authority. The proposal called for negotiations on Hamas demands, including opening border crossings into Gaza and relaxed boating restrictions off the Gaza coast. In addition, its language reportedly upgraded Hamas – a designated terrorist organization – to an equal plane with Israel. Then, President Obama called Prime Minister Benjamin Netanyahu Sunday to make "clear the strategic imperative of instituting an immediate, unconditional humanitarian ceasefire that ends hostilities now and leads to a permanent cessation of hostilities based on the November 2012 ceasefire agreement." A mortar attack on the community of Eshkol near the Gaza border killed four Israeli civilians and wounded nine others, five of whom were in critical condition. At the same time, a squad of heavily-armed Hamas terrorists emerged from a tunnel near Kibbutz Nahal Oz in an attempt to carry out a mass murder attack. The Israeli military killed one terrorist and is searching for the others. The U.S. response? In addition to more demands that Israel stop trying to root out the Hamas terror infrastructure in Gaza, administration officials Monday expressed anger that the Israelis would leak details of the proposed ceasefire and criticize Kerry. This overlooks an important fact – Kerry's proposal also angered the Palestinian Authority – with a senior official telling London-based Saudi newspaper Al-Sharq Al-Awsat that "Kerry wanted to create a framework that would be an alternative to the Egyptian initiative and to our concept regarding it, in order to please Qatar and Turkey." The move would strengthen the Muslim Brotherhood's stature, the PA official said, "because the Americans think – and will be proven wrong – that that moderate political Islam represented by the Muslim Brotherhood can combat radical Islam..."
In their haste to bring about an end to the hostilities, U.S. officials have lost perspective about the conflict and how to prevent the next flare-up. Israel has acknowledged that the depth and sophistication of the Hamas tunnel network greatly surpassed previous assessments. Reports indicate that Hamas was planning to use the tunnels to wage a massive attack involving 200 terrorists against communities neighboring Gaza during the Jewish high holiday Rosh Hashanah. Yet U.S. officials continue to pressure Israel, which already has accepted five ceasefires. All of them were broken by Hamas. Reports out of Israel say Kerry's proposal did nothing to help identify and dismantle Hamas tunnels or strip it of its remaining rocket arsenal. Israel's security cabinet quickly and unanimously rejected it. Israeli Justice Minister Tzipi Livni, considered the most dovish in the cabinet, blasted the proposal as "completely unacceptable" and one that "would strengthen extremists in the region." While its specifics have attracted scant attention in American media, it left Israeli commentators dumbstruck. 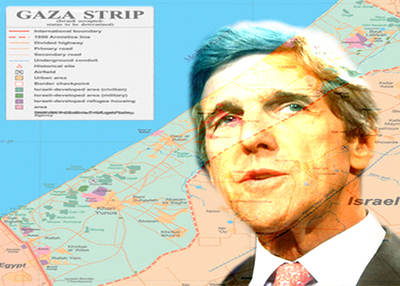 The result "is clearly a major crisis in Israel-US ties at a time when Israel finds itself in the midst of a complex and costly war," Times of Israel editor David Horovitz wrote Sunday in a commentary headlined "John Kerry: The betrayal." An unnamed senior U.S. official briefed Israeli reporters Sunday night, claiming the proposal is being misrepresented. "There was no Kerry plan," the official said. "There was a concept based on the Egyptian cease-fire plans that Israel had signed off on." No one else in the arena seems to agree. The proposal was based on Kerry's consultations with Qatar and Turkey – Hamas' two leading patrons – a move which angered Palestinian Authority officials and other Arab states for empowering a terrorist group and excluding them. "Those who want Qatar or Turkey to represent them should leave and go live there," PA President Mahmoud Abbas's Fatah group said in a statement that Jerusalem Post reporter Khaled Abu Toameh wrote was "directed against Hamas." Kerry's disastrous idea, giving Hamas a clear diplomatic win at a time it had nothing to show but devastation for a fight it started, drew perverse praise. "It takes a certain artistry to irritate and annoy not only the Israeli left and the Israeli right at the same time, but also both Jerusalem and Ramallah," the Jerusalem Post's Herb Keinon noted wryly. "This provided Hamas with a badly needed tailwind," Keinon wrote. "Sure, they were getting clobbered, their human shields were dying, but they were getting what they wanted. The world was talking to them, recognizing their standing in Gaza, presenting their demands. Why stop, things were going their way. And, indeed, they didn't stop, and violated three different cease fires Saturday night and Sunday, including one that they themselves declared." As I noted previously, it was under the terms of the 2012 ceasefire Obama and Kerry are pushing to restore that Hamas diverted money meant to improve life for people in Gaza to building its tunnel network and built an arsenal of 10,000 rockets – each one earmarked for firing on Israeli civilians. If there are suggestions for a better way for Israel to unearth the tunnels and to stop the rocket fire emanating from crammed neighborhoods surrounded by civilians, by all means, offer them up. It's safe to assume that, in the course of invasions in Afghanistan and Iraq, American forces killed many more civilians than the last three Gaza conflicts combined. It's a product of war. The difference is there were not network cameras poised to show the carnage from a drone strike or other inadvertent killing. But let's not pretend that this conflict can be resolved by giving Hamas what it wants. Its officials may talk about economic suffering among Palestinians in Gaza. But if the past month has proven anything, it is that the Hamas leadership cares more about creating Israeli suffering than alleviating the pain and devastation its actions have brought upon the Palestinians. The millions of dollars diverted to building tunnels, to importing or manufacturing rockets, could have done wonders to create infrastructure and jobs in Gaza. And none of that activity would have generated Israeli military strikes. But those facts seem to be lost on the mainstream media which Hamas has handily manipulated to show images of Palestinian casualties rather than show the civilian hiding places—like schools, hospitals, mosques, kindergartens, UN centers—where Hamas has brazenly stored weapons and from where it has also thousands of launched rockets and missiles at Israel. Hamas political leader Khaled Meshaal made clear what Hamas ultimately desires during an interview with CBS' Charlie Rose that was aired on "Face the Nation" Sunday. Rose tried to pin Meshaal down on Hamas' willingness to accept a two-state solution and coexist peacefully next to a Jewish state. "Do you want to recognize Israel as a Jewish state?" Rose asked. "No," Meshaal said. After a long pause, he added, "I said I do not want to live with a state of occupiers." To Hamas, as its charter makes clear, all of Israel is occupied Palestinian land. There can be no peace until Hamas either gives up on its founding principle to destroy Israel or until it is removed from power and influence. Pushing a ceasefire that accentuates Hamas demands could not be more counterproductive. Kerry may be feeling some of the sting from all the criticism. In new remarks Monday, he emphasized the need to disarm Hamas. But he has lost tremendous credibility with those elements who stand opposed to Hamas and its benefactors in Qatar and Turkey. "Jerusalem," writes Horovitz, "now regards him as duplicitous and dangerous." If he really cares about generating a lasting peace, his next, best move might be resignation. As for President Obama, he might start to educate himself about Hamas' horrific murderous actions and agenda before approving a plan that allows this al-Qaida clone to resurrect itself after being seriously wounded by defensive Israeli actions. No. US officials never had perspective. They refuse to admit what is obvious based on the history of Islam and the middle East going back many decades, if not centuries. Organizations like Hamas will continue to attack Israel and everyone in free countries around the world until we are all dead or they are exterminated. They will never stop. They will never rest until we are destroyed. All cease-fires, moratoriums, and other terminally pathetic outbreaks of 'peace' will simply be an opportunity for Hamas to reload. And those who criminally make excuses for Hamas and every other Islam driven terrorist organization should take responsibility for the next wave of dead bodies. But, of course, they won't because they live their lives in a state of chronic hysterical evasion of the reality that we are at war with Islam and that war will end only when one side or other is eradicated. b) The hard line tactics of Israel are not working. HAMAS hides wepons in schools, hospitals, churches and other public places, Israel in turn are taking to smashing such sites FROM A DISTANCE creating inordanate civilian casualties...in essence for every child , mother, father, brother, killed in these strikes... creates the emotional fodder that groups like HAMAS use to gain support, following and to provide the impetus for retrebution for the deaths of family members. Hesbollah are also closely watching this conflict unfold, and are closely watching any outcome. If they become involved things will be different again...! This region is a powder keg...any involvement should be "slowly slowly"
We lose perspective and truth when we give Kerry credit for the US Demands for Israeli surrender, oops ceasefire. Kerry can do NOTHING with explicit directives from his BOSS, the Teflon President. Hanoi John Kerry a Traitor from the past and Present!! Obama / Biden / Kerry and the muslim brotherhood in the White-House are All Anti-Israel / Anti-Zionism / Anti-Semitism / Anti-Christian / Anti-USA!! This is Shameful of Hanoi John Kerry!! It doesn't matter what Israel does: It can set up hospitals on the front lines to take care of Gazan medical needs; it could send a thousand volunteer Israeli bathing beauties to act as prostitutes for the Hamas rank-and-file; it could put on an all-star USO-type show to raise the morale of Hamas's combatants; it could donate half of Israel's GNP to rebuild Gaza -- it won't matter to "world opinion" and won't matter to Obama or Kerry: Hamas will want to annihilate Israel. This is why I think it's foolish for the Israelis to continue supplying Gaza with electricity, medical supplies, food, and other "necessities," because doing so isn't buying Israel any love anywhere, especially not in the White House or in the MSM. The best policy would be to suffocate Gaza, and consequently Hamas. When Gazans are living in Stone Age conditions, perhaps they'll revolt against Hamas, who, as the Prime Minister has stated without hesitation or apology, want to pile up as many Gazan casualties as possible, and isn't hesitant to sacrifice or kill them itself. Extinguish Hamas down to the very last atom. No retreat by Israel, no surrender! That should be Israel's battle cry. Finally, Kerry and Obama aren't stupid. They're malign, nihilistic. They want to see Israel destroyed, as painfully as possible in a long,-drawn-out death through endless ceasefires. Calling them thick-headed is crediting them a humanity they don't deserve.